Full of fun and deliciousness, this sugarpoke has it all! 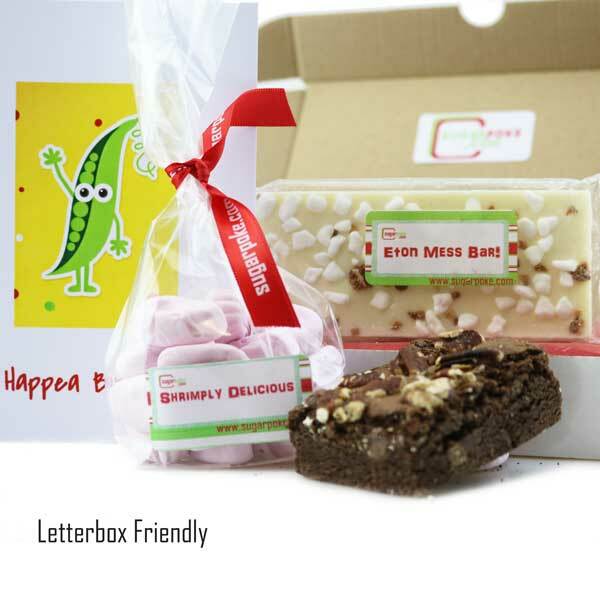 With chocolate, a bag of retro sweeties and a fabulous brownie, it won't disappoint! Shrimply Delicious - a bag of fun filled retro sweetness! Bring those memories back with approx 20 small 'shrimp' soft foam sweeties! Pecan Brilliant Brownie 70g - a magnificently nutty brilliant brownie square made with lashings of Belgian chocolate and topped with deliciously baked pecans, it's one to go nuts over! Gluten Free. Suitable for Vegetarians. Whether it's for a birthday or just to say well done, this has everything to surprise and delight!